Enpro’s ParaDyne liquid polymer activation system strips oil from oil-phase continuous polymer emulsions and hydrates polymer molecules. The system’s impeller disc is designed with multiple vanes that extend from the inlet and outlet. The vanes are recessed and tapered in two axes, providing rapid blending and shear of the solution through the system’s inversion zone. 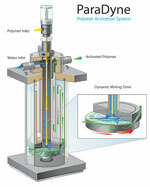 The system can blend a 0.1- to 1-percent concentration of homogenous polymer solution with water.